With three main classes and three paths each, it can be hard to lock down which class you want to main in Crusaders of Light. The game's heavy emphasis on both PvP and raids in end-game only makes the decision harder. You want something you can have fun with while still being useful to prospective guilds and raiders. We're going to go over all three classes in Crusaders of Light, along with their respective paths in this guide, with an emphasis on helping you choose your primary path. While the game lets you swap paths on a whim, the amount of EXP it takes to get your path level up to snuff at later levels is exceedingly high. You're going to be picking a main path whether you know it now or not. You're allowed to choose a path and pump EXP into all three at level 20. Leveling a path increases your stats when you are using it, which all goes toward your total Assessment Score, ultimately making you more powerful. At the time of this writing, there are three classes in Crusaders of Light: Ranger, Warrior, and Mystic. They all seem to be pigeon-holed into certain roles, but they are a bit more diverse than you might at first think. The Ranger may seem like your bread and butter DPS class (and it certainly can be), but this class has some support capabilities in its Animal Tamer branch that diversify its uses. This all makes for a critical-hit-oriented class, one that's able to snipe the enemy with heavy hits using the Razor Wind skill before following up with a barrage of auto attacks. The Scout also receives the skill Starblade Volley, which adds another potent damage skill to this path's arsenal. Choose Scout if you like to absolutely melt your enemies, just don't expect to be able to do much else. It's decent in PvP, but the Forest Guide path is better suited for going against other players. Scout Path is better as a PvE path. Forest Guide is meant to make other players have a bad time. They can be repeatedly bound by Tempest Shot if you get lucky with Slow resists, which in turn, significantly increases damage dealt to them by your character. This path also gains access to the Moonlight skill which, when you've hit level 30, has a chance to provides a more potent version of the skill that hits 2 or 3 times instead of just one. Choose Forest Guide if you want to be a complete nuisance in any form of PvP, where you'll be able to totally shut down your foes without taking a scratch and knock any enemy Mystics out of healing their allies. This path is not very effective in PvE. What you don't see in the image above is the real draw to the path: The wolf's actual capabilities. Once you reach certain active skill levels and unlock new path-exclusive passive and active skills, the wolf itself becomes a supporting monster able to buff the Attack of nearby allies, as well as grant a moderate heal when it disperses. The Animal Tamer Path is best in PvE and is a must-have for raids later in the game, making this a solid choice for players who like to hybrid support in large scale PvE endeavors. Every MMO needs a healer, and the Mystic is Crusaders of Light's answer to the age-old need for sweet, sweet healing. Like the other classes, the Mystic's paths all have their own specialties, meaning not all of them are dedicated healers. This path is almost exclusively useful in PvP situations as it has some good mobility via Void Walk and Light Sigil's synergy, as well as some reliable AoE damage. 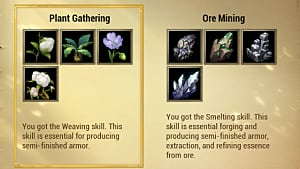 That combination makes this a reliable healer-damage hybrid in PvP fights, which any Verity Spirit player should be focused on over PvE content. This path's exclusive Void Spirit Rain skill is its main attraction, and once you've leveled more, you get increasing chances to reset its cooldown to recast in sticky situations. Choose Verity Spirit if you want to lay waste to several enemies at once in PvP while staying well out of harm's way (and able to get out of it if caught). This is not a very suitable PvE path. This is a critical-hit-oriented path, much like the Ranger's Scout Path. But it plays very differently. Magellana's Judgement relies heavily on the use of its exclusive Suppression skill. Its multiple hits means multiple chances to crit, which will, in turn, do an additional 15% of your Attack Power in damage. The path also converts Light Sigil into an offensive spell at level 25, changing its periodic healing into periodic damage. This path is still able to heal but is the least healing-oriented of the three. It's viable in PvE and PvP, but do be aware that the Scout's damage is still much higher. There's always a trade-off for hybrids. Shepherd is almost entirely focused around the synergy between Consolation and the passive-granting of the Enlightenment state, which is applied on healing or using Purifying Blast on allies. 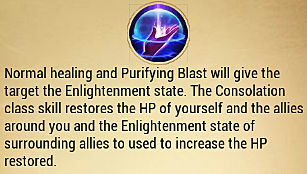 Consolation itself heals you and nearby allies at the same time, with Enlightenment increasing the amount of HP restored on Consolation use. It's fairly straightforward, as is everything about this path. This is a suitable path for most types of content because of the extreme healing. It's most suitable for PvE, but it can do a decent job in PvP. Crusaders of Light's only melee class, the Warrior is a capable fighter able to either dish out damage or tank raids depending on the chosen path. If either of those options sounds good, this may be the class for you. The Executioner Path relies on getting critical hits with skills to further chain critical hits, and if that Anvil Drop crits, it's going to do a massive amount of damage. Its real strength lies in its exclusive Blood Thirst skill which, upon unlocking its passive at level 30, will have its cooldown reset if Meteor Crater crits. The class is able to put out a massive amount of damage and can handle group fight situations with ease. Choose the Executioner if you want to be the heavy-hitting monster you always knew you could be, and are okay with not specializing in either PvE or PvP. The Gladiator is able to repeatedly cast Searing Chains in raids, allowing it to hold enemy aggro -- and it takes less damage from monsters, too. 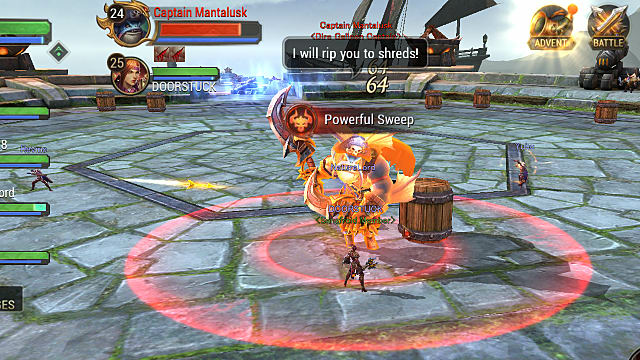 Its exclusive skill, Gladiator Heart, is a fantastic addition to the path's kit and allows it to take even more damage. It's great to use at the start of boss encounters, as well as keeping yourself alive mid-fight. This is not a path you would take for PvP situations as the Gladiator is almost entirely focused on making Gladiator Heart more effective and keeping it up. Plus, the modifier that makes this path take less damage from monsters is completely useless in PvP. 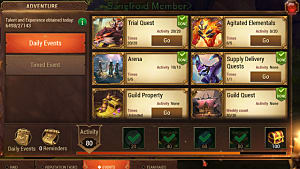 Choose the Gladiator path if you want to be the center of any PvE team at all stages of the game. Everyone needs one, but not everyone wants to play one! This path enhances the Warrior's AoE skills to not only make every enemy near it take nearly continuous damage, but to also deal heavy damage to its primary target. The real clincher for the Fang of Titanus Path is its exclusive skill. Death Gaze ensures no foe will be able to run out of range for long, and at higher skill levels, you can increase its range and potentially have its cooldown reset by the Deadly Forge skill. This is a PvP-oriented path, as the Executioner can deal with PvE much better. Choose Fang of Titanus if you want to rock the battlefield, but be aware you won't be all that useful in raids.